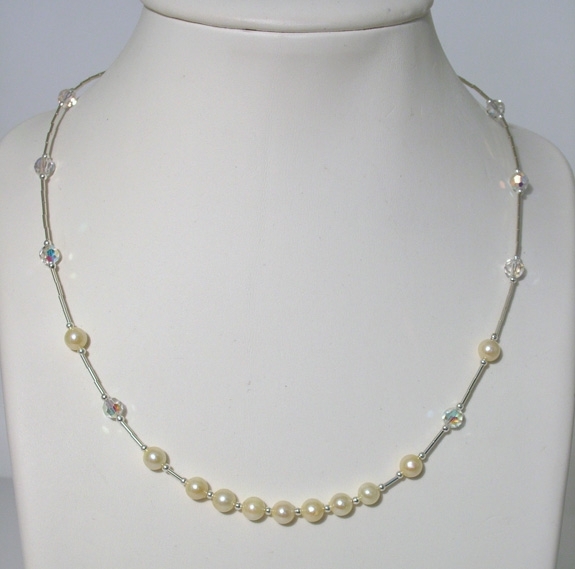 Sterling silver keepsake wedding necklace for bride or bridesmaids.Sterling silver tubes sit between freshwater pearls and Swarovski round crystals giving the necklace lightness and fluid movement with a 16mm silver clasp at the back. There is some choice with the round Swarovski Crystals so if you would like another colour, please let me know. Price shown is for a 16.5" necklace and includes Free UK postage. Worldwide delivery is also available.